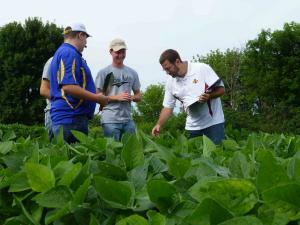 The Iowa State University Integrated Pest Management (IPM) Program is pleased to present the ninth annual Crop Scouting Competition for Iowa Youth. Middle school and high school students (those completing grades 7-12) from Iowa are invited to compete and showcase crop scouting abilities in corn and soybean. The competition will be a one day event focusing on outdoor learning. Previous sponsors include Corteva, Iowa Soybean Association, Iowa Independent Crop Consultants Association, ScoutPro, Iowa Certified Crop Advisors, and Environmental Tillage Systems. Location: Field Extension Education Laboratory (FEEL) at 1928 240 St., Boone, Iowa. Time: Registration begins at 8am. Competition starts at 8:30 a.m and will end by 2:30 p.m. Meals: Lunch, beverages, and snacks will be provided. Purpose: To provide students an opportunity to learn crop scouting and principles of IPM for corn and soybean and to obtain knowledge and skills helpful in future careers related to agricultural and environmental sciences. Prizes: $500 for 1st, $300 for 2nd, $150 for 3rd, $50 for 4th. Each participant will also receive a free event t-shirt or hat. The top two teams will be invited to the regional competition, held at FEEL on August 26, 2019. Team Leaders: Each 2-5 person team is to be led and accompanied by an adult team leader. Teams should work with their leader to train on a regular basis before the competition. Past team leaders have been FFA or agriculture teachers, seed dealers, coop employees, and others. One of the stations will be a written test the principles of Integrated Pest Management and crop scouting. Scoring: Teams can earn a possible 300 points during the competition. There will be approximately 10 stations focusing on different aspects of crop scouting each worth 30 points. One station will be the written test worth 30 points. Participation and teamwork of all team members will be part of the scoring process at each station, to ensure each individual is contributing. Points will also be awarded for professionalism. Youth should be prepared to interact with judges in a professional manner including introducing themselves, shaking hands, and speaking clearly and with eye contact. Registration: To register, please complete and return the registration form (2019_crop_scouting_competition_registration.docx ) or complete the online form (https://goo.gl/forms/vYOVv1QhowDsWgpi2). Please note, there is NO registration fee this year. Lunch and snacks are provided. Participation/Permission/Medical Release form: All participants must have a permission form completed and turned in prior to attending the event. These will be sent to teams once they have registered. Flyer: This flyer, 2019_crop_scouting_competition_flyer.pdf, can be used to advertise the program. There a number of resources that can be used to help prepare students for the upcoming 2018 Crop Scouting Competition. One of these resources, a 14-part IPM curriculum covering a variety of topics, can be downloaded from the IPM Curriculum page. Each presentation is available in both PDF and PowerPoint formats and includes notes. These educational materials are for use in high school or post-secondary agricultural classrooms, or anywhere there is a need for such materials including at home or on the farm. Please do not remove copyright marks. We would like to thank our generous sponsors who make this project possible: Corteva, Iowa Soybean Association, Iowa Independent Crop Consultants Association, ScoutPro, Iowa Certified Crop Advisors, and Environmental Tillage Systems.